With extensive itineraries ranging from 52 to 91 nights, a Grand Voyage with Regent Seven Seas Cruises® (RSSC) – the most inclusive luxury experience™ – offers an opportunity for guests to truly immerse themselves in a raft of incredible destinations, with each sailing featuring a number of indulgent overnight stays. “We’re seeing an increasing demand from Australian and New Zealand travellers for longer cruises that offer guests the opportunity to explore destinations often inaccessible to larger cruise ships, while enjoying extended stays and overnight visits in exotic ports,” said Mr Steve Odell, Senior Vice President and Managing Director Asia Pacific at Regent Seven Seas Cruises. Every Grand Voyage includes unlimited free shore excursions and shore side experiences – making for a full immersive experience in each destination visited. A sailing aboard a luxurious Regent Seven Seas Cruises ship is the ultimate way to explore regions such as Brazil, Argentina, New Zealand, Malaysia, Thailand, Bora Bora, Iceland, St. Petersburg, Lima, Chile, Israel, India, Japan and Alaska in depth. In addition to RSSC’s renowned all-inclusive offering – which consists of free specialty dining, fine wines, premium spirits, shore excursions, an in-suite mini-bar replenished daily, pre-paid gratuities and onboard wi-fi – guests sailing on a Grand Voyage also enjoy free unlimited laundry, including dry cleaning and pressing, complimentary phone time per suite, a commemorative gift and bespoke shore side experiences in select ports. Adding to the incomparable luxury on board, RSSC Grand Voyages include dedicated enrichment programmes, which invite guests to enjoy thought-provoking lectures delivered by leading experts on the regions visited. A featured speaker aboard the Down Under & Far East Grandeur voyage is distinguished British diplomat and commentator on public affairs issues, Sir Tony Brenton, while South American guests will be informed by Latin American expert Terry Breen, to name a few. Departing 20th January 2019, this new 52-night adventure includes up to 123 free shore excursions as well as a free 15-night post land and river experience. Key destinations include far north Queensland, Papua New Guinea, Thursday Island, Komodo, Bali, Singapore, Malaysia, Thailand, Burma, Cambodia and Vietnam en route to Hong Kong, blending the best of bustling Asian cities with picture-perfect islands, colonial architecture, fishing villages and exquisite cuisine. The 15-night post-cruise experience takes in intriguing Chinese icons such as The Great Wall and Forbidden City and a luxurious four-night river cruise up the Yangtze River. This exotic South American odyssey departs Miami on 1st November 2019 for 66-nights, with up to 147 free shore excursions. From the colourful Caribbean and the Andes Mountains, to the exotic wildlife of the South American coast, to horseback riding and the tree-lined boulevards of cosmopolitan Buenos Aires, this voyage shares the spectacular sights of South America in style. Key destinations include Jamaica, Aruba, Colombia, Ecuador, Peru, Chile, Argentina, the Falkland Islands, Uruguay, Brazil, the Amazon River, St Lucia and St Barts. 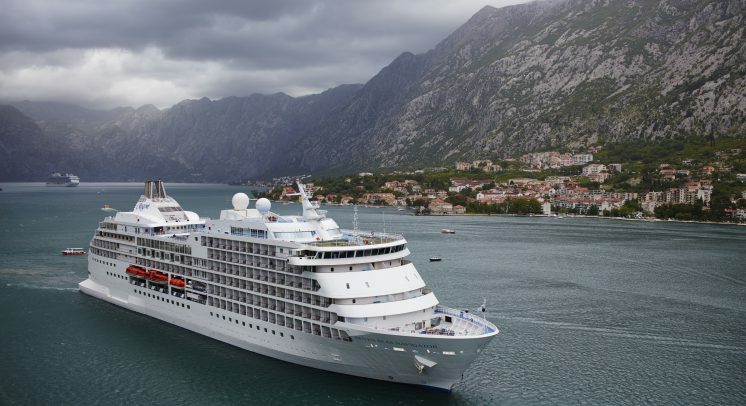 Regent Seven Seas Cruises has recently announced four new Grand Voyages for 2020/21 including a 91-Night Grand Arctic Discovery, 68-Night Grand Cape Horn Adventure, 76-Night Grand Spice Route Quest, and 61-Night Grand Asia Exploration. Departing 15th June 2020 from New York City aboard Seven Seas Navigator, Regent Seas Cruises Grand Artic Discovery is a 91-night exploration of some of the world’s most visually stunning destinations, including Greenland, Iceland, Ireland, Russia and Norway, with the itinerary offering up to 398 free shore excursions for guests. Departing from Los Angeles on 29th October 2020 on the newly refurbished Seven Seas Mariner, the Cape Horn Adventure offers guests a 68-night journey of a lifetime through Guatemala, Ecuador, Peru, Chile, Uruguay, Brazil and Cuba with the opportunity to explore some of the most exotic destinations in the world via up to 163 free shore excursions. The aptly titled Grand Spice Route Quest is a 76-night expedition embarking from Barcelona on 6th November 2020 aboard Seven Seas Explorer. With up to 205 free shore excursions on offer, guests can traverse through some of world’s most intriguing locations such as Israel, Egypt, Jordan, Dubai, India, Sri Lanka, Myanmar and Indonesia before exploring the shores of Australia and New Zealand. This stellar itinerary boasts up to 205 free shore excursions and overnights in Jerusalem, Luxor, Mumbai and Burma. Explore the wonders of the orient with Regent’s Grand Asia Exploration, a 61-night immersive itinerary embarking in Hong Kong on 9th March 2021 aboard Seven Seas Explorer. Take advantage of up to 173 free shore excursions to experience the best that locations such as Vietnam, China, South Korea, Japan, Malaysia and Brunei have to offer.